NEW ORLEANS – Cal Baptist’s women’s cross country team has been climbing all year. On Wednesday, they finally reached the summit. 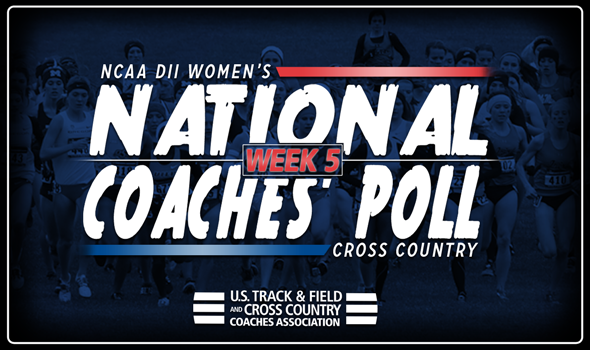 The Lancers jumped five spots into to first place in the fifth week of the NCAA Division II Women’s National Coaches’ Poll, announced the U.S. Track & Field and Cross Country Coaches Association (USTFCCCA). Cal Baptist used a huge weekend to propel themselves into the top spot for the first time in program history. Two weeks after coming in a then-program best sixth-place in the polls, Cal Baptist went out and laid claim to Lewis Crossover team title. A trio of Lancers in Emeline Delanis (21:36.2 – third), Fruzsina Ladanyi (21:46.7 – fourth) and Leanda du Bruyn (21:47.8 – fifth) finished in the top-10 at the meet that featured 353 runners, as well as a slew of nationally-ranked teams. The Lancers own seven of the eight first-place votes in this week’s poll, as well. Cal Baptist’s win caused four teams to lose ground in the polls in Grand Valley State (second), Adams State (third), Western State (fourth) and Simon Fraser (fifth). Each team fell one spot, with Adams State picking up the final first-place vote. Due to Cal Baptist’s hot weekend, this week marked the first time since the second, third, fourth and fifth weeks of the 2015 NCAA Division II Women’s National Coaches’ Poll that either GVSU or Adams State did not hold down the top spot, as Hillsdale had done so during those weeks. While there was a major shakeup at the top of the rankings, the bottom half of the top-10 also saw its fair share of upheaval. Chico State rose six spots to sixth after nearly upsetting Simon Fraser at the 44th Annual Western Washington University Cross Country Classic. The Wildcats finished just two points behind the Clan thanks to first and second place finishes from Hannah Dorman and Alex Burkhart, respectively. Alaska Anchorage returned to the rankings in eighth place after falling out after week two. The Seawolves finished third at the Lewis Crossover thanks to a first-place finish from Caroline Kurgat. Walsh (ninth) and U-Mary (10th) jumped one and three spots, respectively, to claim the final two spots in the top-10. Only Pittsburg State (seventh) remained in its respective spot amongst top-10 teams from a week ago. Outside of the top-10, two teams gained a little ground in the rankings, while two teams returned after brief hiatuses on the outside, looking in. Dallas Baptist moved up two spots to 18th and Augustana (S.D.) jumped four spots to 19th while Northern Michigan (17th) and Minnesota Duluth (22nd) both found themselves amongst the top-25 once again. Northern Michigan was last ranked 19th during the second week of the season, while Minnesota Duluth was 22nd in that same poll.